MySpace in the US has started using Google Maps to show the locations of business listings. At the moment this seems to be a US only service (readers outside of the US will probably find the links in this post default to the MySpace domain for their country). MySpace Local is a joint project with Citysearch. Citysearch are providing their huge database of business listings and MySpace are adding the social networking features, such as user reviews. 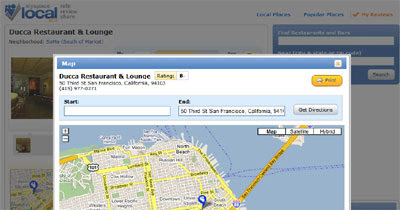 Using MySpace Local it is possible to find a local bar or restaurant (or any other type of business) and read the user reviews before planning you night out. Each featured business comes with a 'Get directions' link, which is where Google Maps comes in. Clicking on the link opens a lightbox type window with a Google Map of the business' location. At the top of the map it is possible to add your starting location and the map will return driving directions from there to the business. It's absolutely amazing how quickly all of these maps were released! I can't wait to graduate from my online GIS degree program so I can start WORKING on things like this. It seems the applications for GIS-related technology are basically limitless- the CDC should be forced to have an official system for tracking infectious diseases that's based on mapping technology, how do they not have one already? !